LED Road Flares are of Exclusive Options for Car Owners/Drivers that should be prepared for unavoidable problems like flat tire, breakdown, and minor accidents.The Flashing Led Road Flares is used as a warning light to instantly warn drivers to slow down and protect yourself and your family from speeding or distracted drivers. Led Road Flares is a lighting option specifically designed to be mounted onto emergency, construction, or work vehicles. Led traffic warning lights are designed to provide highly visible warning and caution to on coming vehicles when your car breaks down, to approaching motorists of potential hazards and specific directions to motorists, protect your safety and prevent car crash. 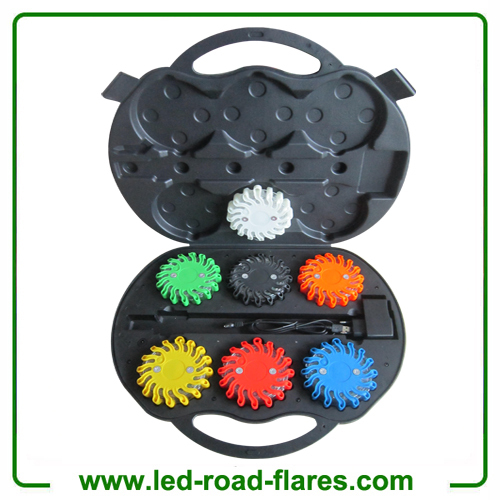 Led road flares is used as lantern in case of power failure, earthquake, hurricane or other disaster.It is seen in the dark. Be bright at night on the road at a construction site or work site. Alert other workers or passers-by that you need help and are under duress when shouting does not help and want help from emergency services. 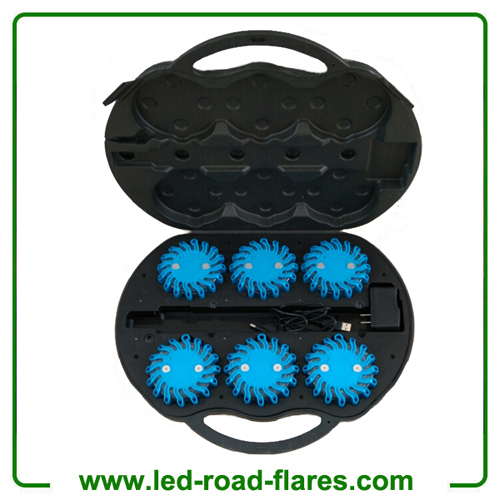 Each Rechargeable Led Road Flares 6 Packs Blue is designed with an easy-to-install assembly for any truck, fleet, or emergency vehicles application. 2. Shock resistant construction make the led road flares very durable and can withstand the impact of roadside traffic. Can even be run over by a truck and still operate. Used by fire. Police, and other emergency responders. To turn off the led road flares without cycling through the 9 light pattern, just press and hold ON/OFF button for 3 seconds. TWO LEDs will flash five times and then turn off. When ready to operate again, press ON/OFF button to return to the last flash pattern before turning off. Charging: The indicator light aside led road flares turns RED and make a Green/Red alternating flash. 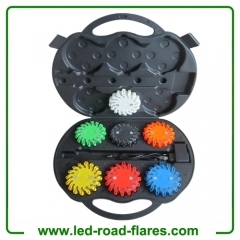 Led Raod Flares will bring you safe and secure and can be used as follows. LED Road Glares is an ideal signal light to identify Road Hazards, Mark Detours, Underwater Repair Applications And More and A great item to keep in your vehicle at all times that can be used to signal for help or identify road hazards and used for traffic control, firefighters, EMTs, rescue services, first responders, members of emergency response teams and the general public and used in cars, trucks, boats, RVs, semi-trucks, construction zones, and emergency response vehicles.